Maybe it was refinishing a piece of furniture, or a craft project with buttons or wine corks. Maybe it was even taking a picture of your kids, but after you were already into the project, reality hit and you discovered that perhaps it wasn’t as easy as you initially thought. Please tell me that I’m not the only one! That’s how this beach chair was for me. It was the bane of my existence for the better part of a day and I may have even let out some screams of frustration . I am happy to say that I persevered and found a way to make it work. Even better, I learned several things in the process about how to do it better the next time! 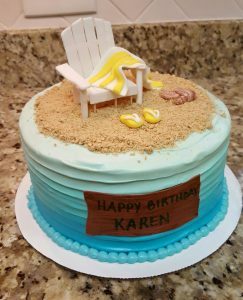 This beach themed birthday cake was the culmination of a fun evening out for a group of friends. 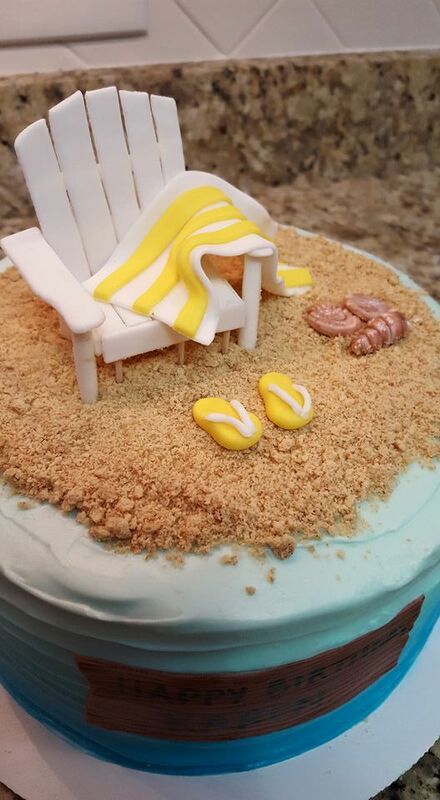 I hope that the cake put them in a relaxed state of mind and has them looking forward to their Caribbean vacation in a few months!